Last week we did a post on an American classic, Jambalaya, which we served at a dinner party with skillet cornbread, another homegrown American classic. As promised, we’ll now see how to make this wonderful dish. 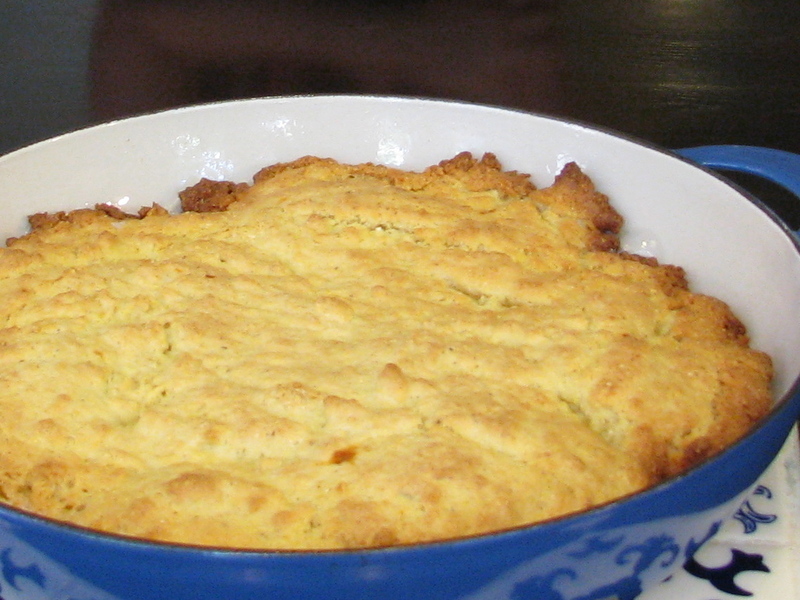 Skillet cornbread is primarily a Southern dish. In the North, the tendency is to bake a sweeter, muffin-like concoction. In the 1700 and1800’s, it was an incredibly simple dish – corn meal, eggs, milk, salt, sugar and a fat of some type – usually lard. 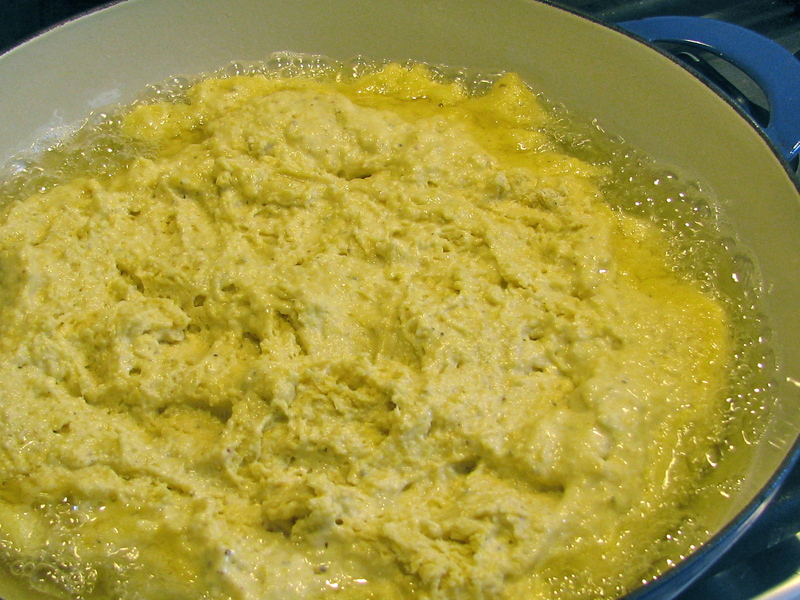 Today, most recipes (but not all) use butter instead of lard and they usually add flour with the cornmeal. This produces a much lighter texture. “We had pans with handles 12 or 15 inches long. We often came across flour or corn meal; sometimes bought it, sometimes otherwise. We would stir this up, make a batter of it, grease the pan well, hold it over the fire, keep shaking the pan to keep the slapjacks from burning fast. 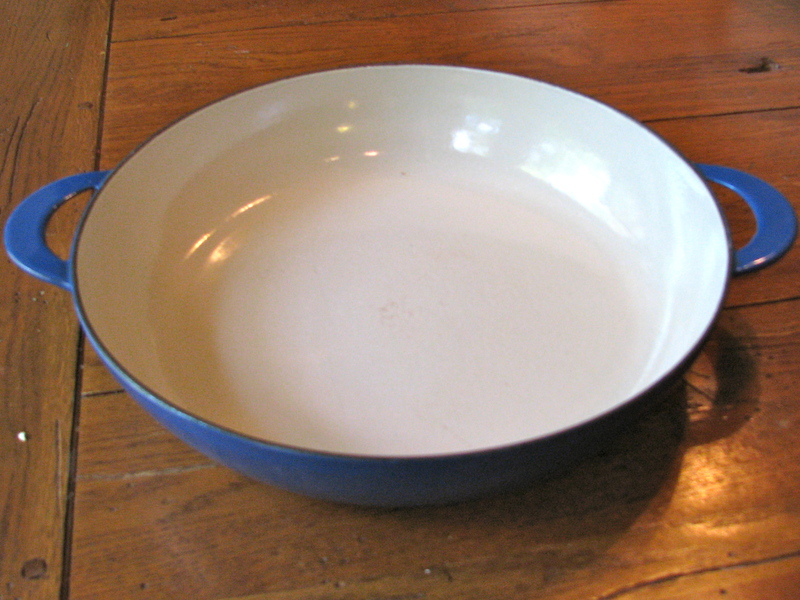 If you want a nice crust, you need a heavy cast iron skillet or, my favorite, a cast iron baking dish (Le Creuset has a great one that is about 12” in diameter). You can also do quite well with a ceramic pie pan, even if it doesn’t have the sexiness of the iron skillet or the cast iron baking dish. This recipe is based on a version that appeared on The Food Network called Gina’s Crusty Cornbread. This is a made-from-scratch cornbread. A friend asked why I don’t use the boxes of cornbread mix you see in all the stores. I didn’t bother to answer – he is a lost to the cause of Bravado cooking and it is best that he continue to wander in the wilderness. Put the vegetable oil in the skillet or pan that you are going to use. Add a little more if necessary so you cover the bottom of the pan. Put the pan in the oven and set the temperature to 400 degrees. Have a glass of wine or a cup of coffee and get the rest of the ingredients out. We need to burn a little time since the pan needs to get really hot and that takes about 15 minutes. Cut the butter into pats and melt in a small saucepan. Make a well in the dry ingredients and slowly pour the wet ingredients into the well while you stir with a whisk until the batter is nice and smooth. Get the pan out of the oven and pour the batter into the pan. The hot oil will bubble up around the sides, which is just fine. 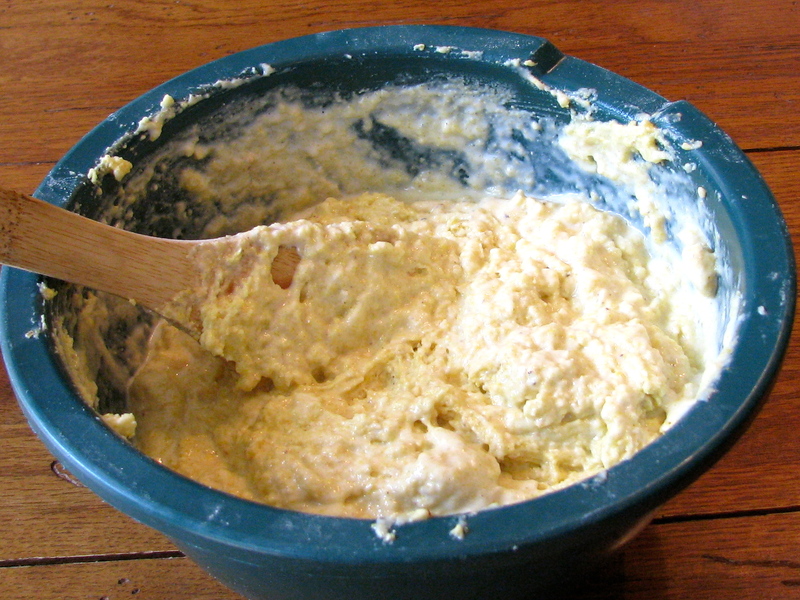 Use a wooden spoon to spread the batter around. Bake for 25 minutes until golden brown and a toothpick in the center comes out clean. The center is the last thing to bake – who knows why – but you have to be careful that it is done in the middle. You can do many things with cornbread. It is great with any soup, especially chili. Eat it alone with butter or honey. If you want to experiment, add some things to the batter like a little Jalapeño pepper or some red and green bell peppers, chopped and sautéed first. Store in a ziplock bag and it will last for a week. It is also easy to reheat in the oven or microwave. 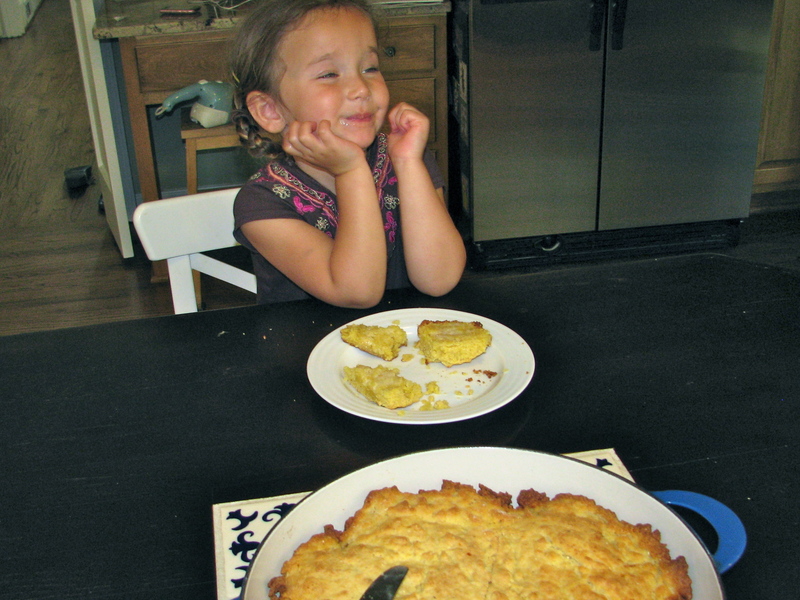 BTW, kids absolutely adore hot cornbread. Double the butter for amazing results!